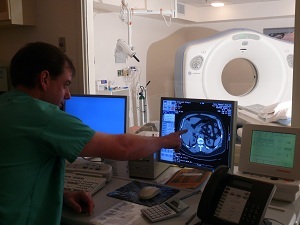 The Radiology Departments at Curry General Hospital in Gold Beach, and at Curry Medical Center in Brookings, have a wide range of imaging tools and technologies for early detection, examination, and diagnosis of various illnesses and abnormalities. The medical imaging staff works closely with physicians to accurately interpret results so each patient gets the best possible care. At Curry General Hospital the Radiology Department's normal hours of operation are Monday through Friday, 8 a.m. to 6 p.m. On-call Radiological technicians are available 24 hours a day to provide care for patients in the Emergency Department and in-patient settings as necessary. For more information, call 541-247-3117. At Curry Medical Center the hours of operation are 8 a.m. to 8 p.m., 7 days/week. Call 541-412-2050 for more information. The radiologists of Curry General Hospital and Curry Medical Center are accredited by The American College of Radiology. The Mammography department is also fully ACR accredited. ACR Accreditation is the Gold Standard in radiological accreditation and is widely recognized as a hallmark of safe, quality care. The purpose of these programs it to set quality standards for practices and to help radiology units continuously improve the quality of care they provide to their patients. When you see the ACR gold seal, you can rest assured that your prescribed imaging test is being done at a facility that has met the highest level of imaging quality and radiation safety. The facility and its personnel have gone through a comprehensive review to earn accreditation status by the American College of Radiology (ACR), the largest and oldest imaging accrediting body in the United States and a professional organization of 34,000 physicians.